Some years ago, I fell in love with Bordeaux. It’s just my kind of city: small, so as not to be overpowering, full of history, with buildings of great elegance, the river Garonne and fabulous shops. I wanted to buy an apartment so that I could escape Fez when I need a bit of western culture, or when it’s too hot in Morocco. 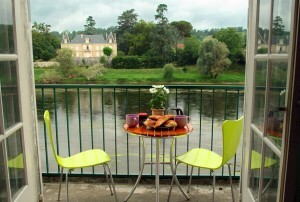 But properties in the areas of Bordeaux where I would have liked to buy were at least three times what I could afford. I started looking further inland towards Bergerac where, as a 13-year-old schoolgirl, I’d visited my penfriend. We did that in those days, when people still wrote letters. The return flight from Stansted cost ₤14, a lot of money at the time. I happened upon the small town of Ste-Foy-La-Grande that lies on the Dordogne River in the Gironde, an hour from Bordeaux and 20 minutes from Bergerac. Wine country, of course, with St Emilion just down the road. 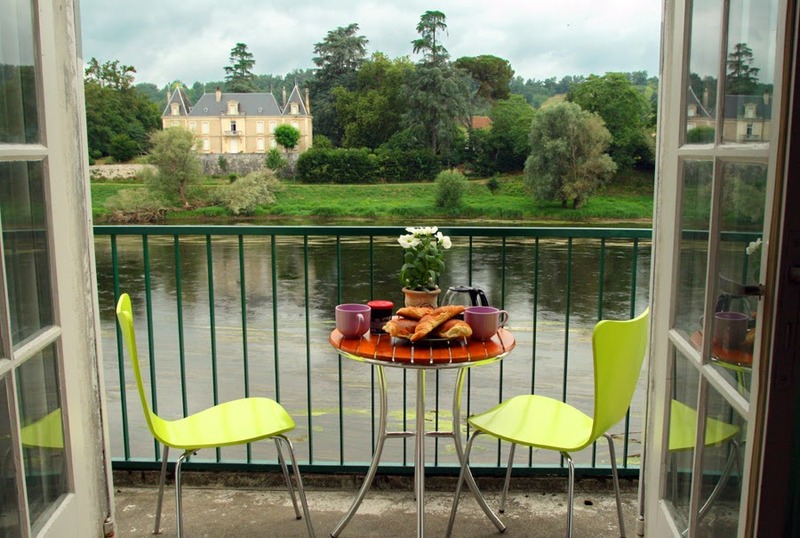 I was lucky to find the perfect pied-à-terre with a balcony that overlooks the river and a pretty chateau on the opposite bank, flanked by the small village of Port-Ste-Foy and vineyards. I spend a lot of time on that balcony. My desk is positioned so that I can see the view. The bird life is wonderful without straying from my balcony – I watch herons white and grey, kingfishers, mallards, cormorants, wagtails, mute swans in the winter and plenty of owls. 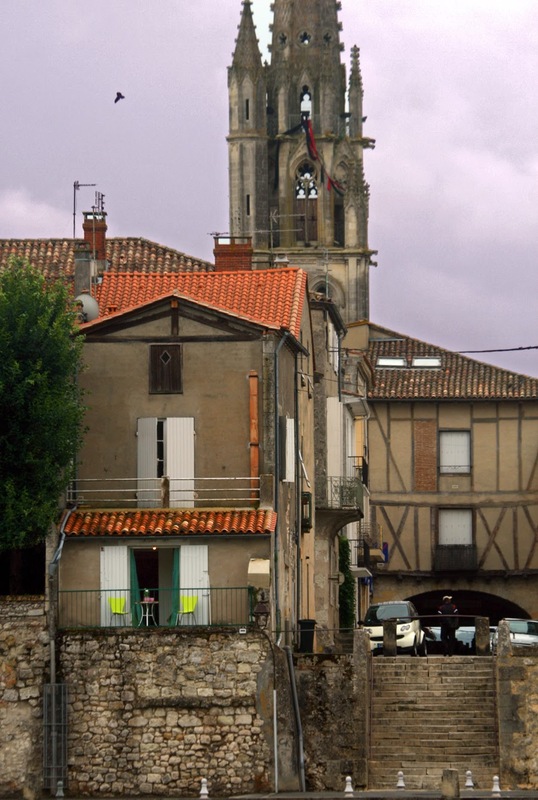 Ste-Foy-La-Grande is one of the smallest communes in France with just 51 hectares and around 2200 people. It was founded by Alphonse de Poitiers 760 years ago as a bastide, a new town with military and commercial importance. The medieval bastide towns were laid out in grid-fashion, with a central square surrounded by arcades. There are half-timbered buildings and pretty round towers. Flat-bottomed boats called gabarres carried wine from the Périgord region to Bordeaux to be exported, so there is a tow-path alongside the river. 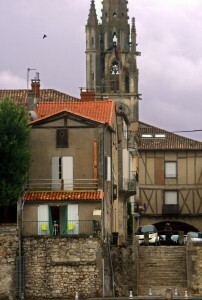 The town sits on the Vézelay route to Santiago de Compostela; pilgrims with their tall walking sticks and cockleshells on their backpacks follow the pointers – wooden posts and brass shells embedded in the pavements. They must have their pilgrim’s passports stamped at the tourist office here. Ste Foy’s greatest claim to fame is the Saturday market, dubbed the best in France in 2014. The main streets of the town are closed to traffic and vendors sell everything from fish to foie gras, local vegetables and fruit, live chickens, second-hand books, bric-a-brac, clothing and shoes, wine, spit-roasted hams, cheeses, artisanal breads, meat, poultry and charcuterie. There’s always a group of elderly Frenchmen and women in berets playing their accordions and saxophones. For all that, it’s become very quiet over the last few years as shops close or move to outlying districts. Many restaurants, too, have closed down and all that’s left are a few sandwich places and a couple of Chinese. But there are some great bars. I avoid the one that always seems full of English people where the house-wine is cheap and nasty, but there are several others. On Sunday mornings in the autumn and winter it’s a great experience to head for one particular seedy dive complete with early beer drinkers playing pool and to buy a dozen oysters from the stall outside and enjoy them with a glass of white wine. And that penfriend? She still lives in Bergerac where she has the beauty salon that she wanted when we were 13. I wrote to her to tell her I was close by, but never heard back. I haven’t pursued it – perhaps we’d be too different now to pick up where we left off.